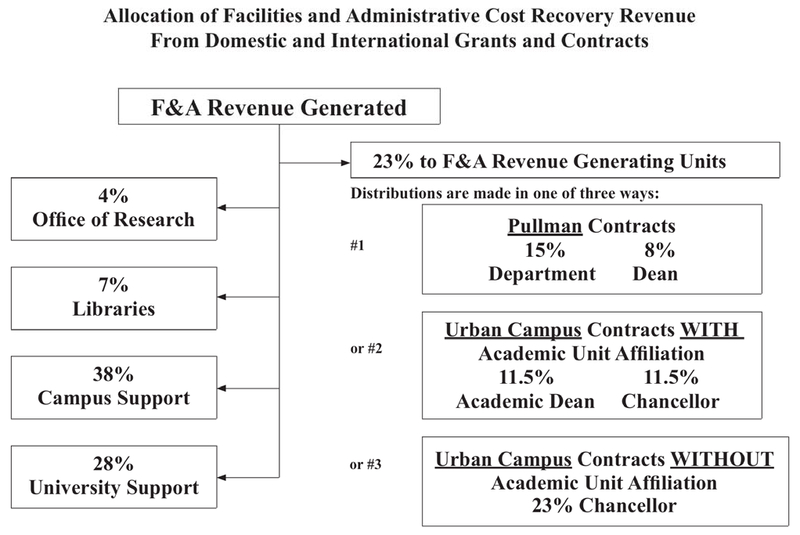 Most grants and contracts pay the University facilities and administrative cost recovery (F&A) fees. These payments are meant to reimburse the University for costs associated with use of the physical facilities and other University support that are not billed directly to the grant or contract. F&A funds are an important revenue source for the University. It is necessary and usual to combine them with other revenues, such as state appropriations, for general University support. At WSU, F&A revenue contributes to the planning budget level (PBL) for the following: graduate assistantships, grants-in-aid, libraries, utilities, facilities maintenance, research animal care, biological safety, research compliance, environmental health services, post-award sponsored program services, payroll, accounting, purchasing, the sponsored projects office, radiation safety, grant and research development, and grant matching. WSU returns some F&A revenue to the units that generate it. This is to reimburse these units for their own facilities and administrative costs and to stimulate further research. Allocations of both domestic and international F&A revenue to the units are distributed according to the following policy: F&A allocations to units are made quarterly based on actual F&A amounts collected the previous quarter. 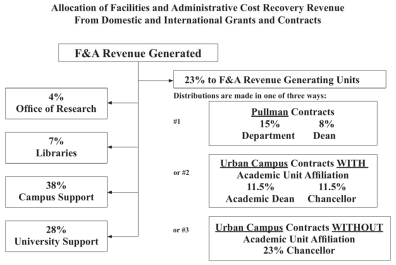 Each area is allocated 23% of gross F&A revenue collected, with 65% of the allocation (15% of F&A revenue collected) going to the department, and 35% of the allocation (8% of F&A revenue collected) going to the dean. The department is responsible to make some of the F&A revenue allocation available to the principal investigator to assist with grant administration, travel, student assistants, development of new research, grant matching or other expenses. Also, departments and deans are responsible to provide administrative support to centers, since they do not receive F&A allocations directly. For projects at urban campuses the allocation for academic support is different depending upon whether or not there is participation by an academic department. For projects with academic unit affiliation, the allocation of 23% of F&A collections is split equally between the chancellor and the academic dean. For projects without academic department involvement, the entire allocation of 23% of F&A collections goes to the chancellor. In addition to the allocation for academic support, urban campuses receive 38% of gross F&A collections as an allocation for physical plant and campus support. The Office of Research receives 4% of total gross F&A revenue for research development, grant matching and to supplement needs in research animal care, biological safety, research compliance, radiation safety, and grant and research development. Libraries receive an allocation of 7% of forecasted gross F&A revenue collections, with an allocation at the start of the year based upon budgeted F&A revenue and a supplemental allocation near the end of the fiscal year based upon the forecast of actual year-end revenue.